Although mochi is traditionally associated with the Lunar New Year, the Japanese really eat it pretty much year around in various forms. Made from pounded glutinous rice flour, mochi is often thought of as a sweet item, stuffed with adzuki bean paste. Then again, that sticky chewy texture which only glutinous rice can provide is much prized all through Asia. Here are a couple of different variations on the theme (both readily available here in Houston. 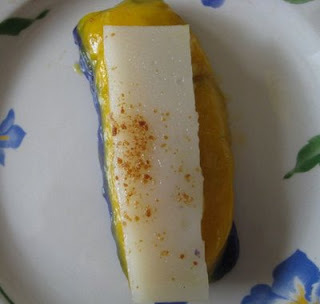 The multicolored item is a Filipino dish called sapin-sapin - the top layer is flavored with coconut, the yellow layer is supposed to be flavored with sweet corn, and the lower purple layer is flavored with a purple tuber called ube. Ube is worthy of a discussion of its own another time. While I am uncertain if this version was colored with food coloring, usually the striking purple color of ube is quite natural. 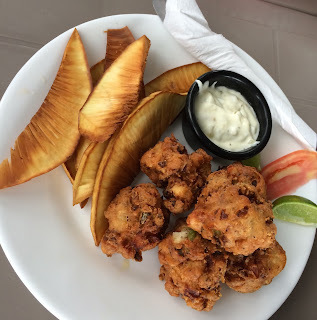 The brown sprinkling on it is a unique item - it is a by product of making coconut milk; the caramelized proteins that come from cooking down the coconut milk to produce the oil. It's quite delicious, if a bit rich and oily. 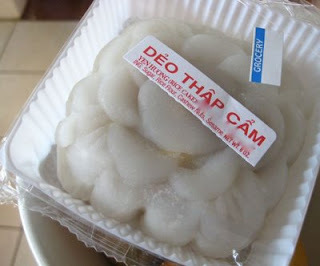 Of course, glutinous rice cakes figure in other cuisines as well. Here is a version from the local Vietnamese community which is stuffed with cashew nuts in place of the usual bean paste. The cake itself is very sweet, and best eaten with hot unsweetened tea.